Jim Rossignol’s recent guest post about the architecture of “evil lairs” reminded me of a brilliant vignette from Deyan Sudjic’s 2005 book The Edifice Complex. In a chapter called “The Long March to the Leader’s Desk” – a virtuoso example of architectural writing, and easily the best chapter in the book – Sudjic describes how Emil Hácha, Prime Minister of what was then Czechoslovakia, came to visit Adolf Hitler in his Albert Speer-designed Reich Chancellery in Berlin. The Chancellery – Hitler’s “evil lair,” if you will – proved so psychologically overpowering that Hácha, “a short man in his late sixties with thinning and receding hair,” according to Sudjic, suffered a heart attack and very nearly died after walking through it. [Image: Hitler’s office in the Chancellery]. Hácha was white faced, anxious, and dizzy as he made his way across the entrance lobby, completed just eight weeks earlier. He was exactly the kind of visitor the Chancellery was designed for. If ever architecture had been intended for use as a weapon of war, it was here. The grandeur of the Chancellery was an essential part of Hitler’s campaign to browbeat Hácha into surrender. Beyond the courtyard, itself a kind of summation of the Nazi state, was an elaborate sequence of spaces inside the Chancellery, carefully orchestrated to deliver official visitors to Hitler’s presence in a suitably intimidated frame of mind. After a quarter-mile walk, visitors were left in no doubt of the power of the new Germany. Past the chancellery guards and out of the way of the floodlights, [Hácha was led] across the porch and into a windowless hall beyond, its wall inlaid with the pagan imagery of mosaic eagles grasping burning torches garlanded with oak leaves, its floors slippery with marble. There was no furniture, nor even a trace of carpet to soften the severity of the hall. (…) Under the hovering glass and the massive marble walls, the bronze doors at the far end of the hall shimmered and beckoned and threatened. Visitors were propelled down its length as if being whirled through a wind tunnel. As Hácha walked, he was aware of his heart accelerating in rapid fluctuating beats. Even here, at the very door to Hitler’s study, Speer’s spatial theatrics weren’t finished. Passing through those gigantic doors, Hácha found himself standing at one end of a 4000-square-foot room, surrounded by “blood-red marble walls.” At the other end, in front of a fireplace, was “a sofa as big as a lifeboat, occupied by Joseph Goebbels and Hermann Göring” – and nearby was Hitler, seated at his desk. By that point, though, Czechoslovakia’s fate was sealed: Hácha’s will collapsed as soon as Göring began to describe the Nazis’ military capabilities, and he suffered a heart attack. [Image: ANY Design Studios, via Building Design]. Following a few links from the perennially great things magazine, I discovered this new attempt at a future Martian architecture. Meant to house “visitors,” we read, at the Martian north pole, “ANY Design Studios has designed a robot on legs built of Martian ice.” It comes complete with padded walls and a nice little bed. Note, however, that the walls (on the right) have been painted to look like the Pacific northwest: even on Mars, we will live within simulations. “What would it be like to spend nearly two Earth years at the Martian north pole,” we’re asked, “a place where darkness falls for nine months of the year, carbon dioxide snow flutters down in winter and temperatures drop to a chilly minus 150 centigrade?” I, for one, think it would be wonderful. The architects behind the project go on to explain that they “have also been exploring the possibility of reproducing programmable Earth environments in a room we have called the ‘Multi Environment Chamber’. Settlers on Mars may well be able to make themselves a cup of tea and settle into a chair with the sun gently warming their skin, cool breezes, and the sound of songbirds of an English orchard on a warm July afternoon” – assuming that such an experience wasn’t precisely what you were trying to get away from in the first place. These “programmable Earth environments,” though, should undoubtedly include a setting in which you are sitting in a room in southern California, which has been kitted out to look like a Martian base – inside of which a man sits, reminiscing about a room in southern California that he once decorated to look like a Martian bungalow… Which would be referred to as the interplanetary architecture of et cetera, et cetera, et cetera. Phrased otherwise, of course, all of this would simply be an inversion of what William L. Fox describes in his recent book, Driving to Mars. There, Fox writes about “the idea of practicing Mars on Earth” – which means simply that, even as I write this, there are teams of astronauts on a remote base in northern Canada, acting as if they are already surrounded by Martian topography. It’s a form of psychological training: act as if you have already arrived. Act as if you never left. But why not practice, say, Jupiter, instead? Why not be even more ambitious and use each planet in this solar system as a base from which to simulate the rest? Or you could just abandon simulation altogether, of course, and experience Mars as Mars. Mars is an alien landscape, then, in everything but name. 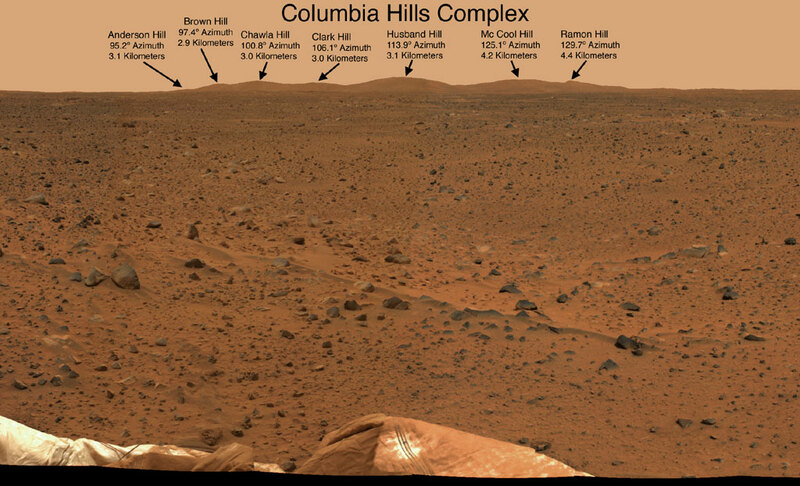 Even more fascinating, at least for me, is the small range of Martian hills now “dedicated to the final crew of Space Shuttle Columbia.” Accordingly, these hills now appear on maps as the Columbia Hills Complex. An entire landscape named after dead American astronauts? Surely there’s a J.G. Ballard story about something exactly like this? Then again, according to one reviewer: “A story by J.G. Ballard, as you know, calls for people who don’t think.” Uh oh. (Note: For more on Martian architecture don’t miss the unbelievably weird proposal behind Mars Power!, discussed earlier on BLDGBLOG).